A focused tour of Lloyd Street Synagogue is offered on Sundays at 4:00pm. Due to the historic period and age of our two historic synagogues, some areas are not accessible to visitors with physical disabilities. It is necessary to climb stairs to enter the Lloyd Street and B’nai Israel Synagogues. There is a virtual tour of both synagogues that is available by request to watch in the Museum lobby. This film is approximately 20 minutes in length. Preview the synagogues with our special video tour here! Would you like to learn more? Check out our exhibit Synagogue Speaks. 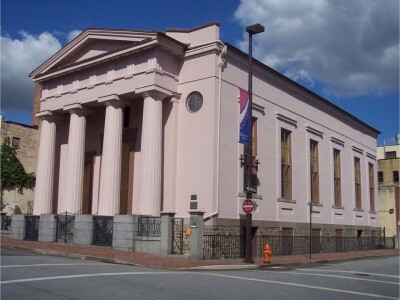 The Lloyd Street Synagogue was built in 1845 by the Baltimore Hebrew Congregation. It was the first synagogue erected in Maryland, and today it is the third-oldest standing synagogue in the U.S. The Synagogue was restored in 1963-65. Recent archaeological and architectural discoveries, including the original 1845 mikveh (ritual bath), are accessible to Museum visitors. Noted Baltimore architect Robert Cary Long, Jr. designed the Lloyd Street Synagogue in Greek Revival style. In 1861, the original building was enlarged by architect William H. Reasin, keeping its original classical style in the sanctuary and exterior façade. For more than a century, the building was used as a house of worship, study, and assembly by three different congregations: Baltimore Hebrew Congregation (1845-1889), a traditional congregation that later “reformed” its liturgy and practices, St. John the Baptist Roman Catholic Church (1889-1905), one of the first Lithuanian “ethnic” parishes in the United States, and Shomrei Mishmeres HaKodesh (1905-1963), one of the leading Orthodox congregations of the East European immigrant community. The Historic Lloyd Street Synagogue. Built 1845. 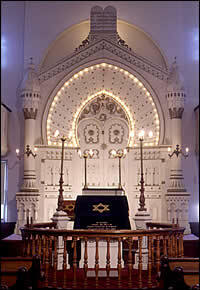 The B’nai Israel Synagogue is a beautiful example of Moorish Revival architecture. This ornate building was restored to its original glory, and today visitors can enjoy the magnificent hand-carved ark wall that adorns the sanctuary. The synagogue was built in 1876 by Congregation Chizuk Amuno. Chizuk Amuno (“Strengthener of the Faith”), was founded in 1871 by members of the Baltimore Hebrew Congregation who had left the Lloyd Street Synagogue because they resisted efforts to “reform” its liturgy and ritual. After worshiping in rented quarters for a few years, the new congregation built a synagogue of their own, just down the block from their former congregation on Lloyd Street. Chizuk Amuno was the last synagogue built by Baltimore’s German-Jewish immigrant community. The congregation occupied its new synagogue for only 19 years. In 1895 the building was sold to the B’nai Israel Congregation, a newly-formed congregation composed largely of recent immigrants from Russia. Today, the B’nai Israel Congregation still occupies its historic synagogue. It is the oldest Orthodox synagogue in continuous use within the Baltimore metropolitan area.